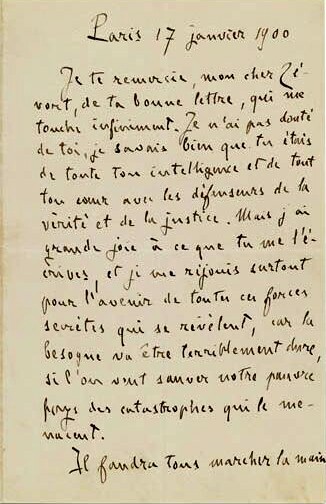 In this previously unpublished letter Zola expresses gratitude to the academic and historian Edgar Zevort (1842-1908) for his support for the Dreyfusard cause and for Zola himself in the personal trials caused by the author’s support for Dreyfus. I thank you my dear Zevort for your good letter, which touches me infinitely. I didn’t doubt you and I knew full well that you were with the defenders of truth and justice with all your intelligence and all your heart. But I feel great joy in your writing me, and I especially rejoice in the future of all the secret forces that are making themselves known, for the task is going to be terribly difficult if we want to save our poor country from the catastrophes that threaten it. We must all march hand in hand, and I am happy to feel yours in mine.